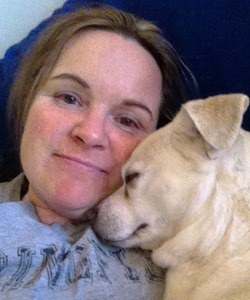 Karla has been caring for the dogs and kitties in the kennels at Cody Veterinary Hospital for over a decade. She loves each and every animal that she meets and often recognizes your furry friend around town following their visit. Karla pays close attention to each and every boarder so that she can alert the doctor if anything is out of the ordinary, an indication of the pride she takes in her work every day. Cody Vet was very lucky to find Karla all those years ago and is even luckier to still have her. Karla came to Cody in 2002 with her wonderful husband Rich and their son Conner who has grown up before our eyes. Looking back, it seems like Karla spent most of her time at Riley Ice Arena being a dedicated hockey mom and traveling with his team. Now, Karla still enjoys traveling but opts to take vacations with her hubby to exotic locations instead.